Yet, another bloodshed. Less than two years have passed since Israel’s latest major military offensive in Gaza, Operation ‘Pillars of Defense’. The months since went by so fast that it feels as if Israel’s renewed aggression against Gaza, this time dubbed Operation ‘Protective Edge’, is only a continuation of its predecessor. 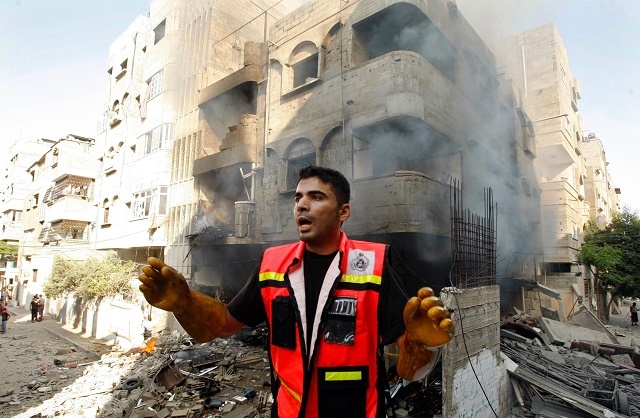 Back then, more than 130 Palestinians, mostly civilians, and six Israelis, were killed before an Egyptian-brokered ceasefire was successfully negotiated to bring an end to eight days of intense bombing. However, the state of violence remained in Gaza, through daily Israeli violations of the ceasefire: farmers shot with live ammunition as they tended their land, fishermen abducted while fishing at sea; and the overall Israeli control over every aspect of Palestinian life, which denies them their most basic rights. In an article I wrote at the time for Ceasefire, I argued that the bombing would soon be over, and that everything would be back to normal. By ‘normal’, I meant in the same way, and in the same conditions, Gaza had been before the attacks started on November 14th. It looked certain this would come to an end, but what would follow after a ceasefire was reached is what should in fact matter more than the termination of the attacks per se. If anything, the attacks only helped to bring the world’s attention the plight of 1.8 million Palestinians living in the Gaza Strip, which by then had entered its fifth year of a hermetic Israeli-imposed blockade. What Palestinians needed was not ephemeral ceasefires. More than anything else, they needed a fundamental solution that would bring to an end their insufferable plight engendered by Israel’s policies and belligerent practices in the occupied territories, primarily its effective control and brutal blockade of the Gaza Strip — clearly, assisted by an ensemble of other key players including the US government and its subcontractor, the Abbas Authority in Ramallah. Only a solution that addressed these underlying causes of the conflict would ensure the eradication of a deeply unjust status quo the very existence of which would sooner or later precipitate a response from a Palestinian population at breaking point in face of daily injustices. Sooner than anyone would have expected, a new large-scale Israeli offensive has returned. Five days into this aggression, over 160 Palestinians have been killed; nearly half of them women and children. More than 1000 have been injured, and tens of houses have been entirely destroyed while more than 400 others have been partially damaged. Palestinian resistance groups, mainly Hamas’ military wing Al Qassam Brigades, fired hundreds of projectiles deep into Israeli territory. No Israelis have been killed so far. At the time of writing, a ceasefire doesn’t seem to be in the offing, and Israel threatens it will start a ground invasion into the coastal enclave in the coming days. Over the next few days, the death toll will surely increase; more Palestinian civilians, particularly women and children will be killed, many others will be injured and maimed, more houses will be demolished, and more innocent civilians, as a result, will be displaced. Meanwhile, in Israel, the sirens will continue to sound as Palestinian projectiles fall into Israeli cities. Since it is unlikely that Israeli civilian deaths and injuries will be significant, one can at most speak of Israeli civilians suffering from, and treated for, shock. Meanwhile, momentum continues to build within Israeli society behind anti-Arab, anti-African nationalistic fervor that reminds us of the worst excesses of European fascism. Yet, there are voices which still bizarrely insist that neutrality demands we take no sides in conflicts such as these. Some would point out that Israelis are also being targeted by Palestinian rocket fire from Gaza. They would claim that morality requires that we express our sympathy with the loss of civilian life on both sides and condemn the use of violence by the two sides of the conflict. Such is what reputable agencies like Save the Children have done – betraying their mandate to children – or the BBC, while claiming impartiality. Neutrality, however, is an amoral, if not immoral, position in this case. Insisting on neutrality is simply a refusal to recognise the asymmetry of this so-called ‘conflict’. It is a refusal to recognise that one party, i.e. Israel, is the main aggressor while Palestinians are the primary victims of Israel’s policies. Neutrality is allowing for further impunity for Israeli crimes since “both sides are to blame”, and permission for more such aggressions. There clearly exists a context to every “renewed cycle of violence”, and to treat both sides as equal is mainly to take things out of this context. Israel is obviously the strongest party in this conflict; it is an occupying power that has employed all forms of violence on a daily basis in order to maintain its military occupation and blockade over Palestinians in the West Bank and Gaza Strip respectively, the denial of the right of return to Palestinian refugees and the imposition of a racist ethnocracy over its Palestinian citizens. In Gaza, Israel continues to exercise full control over the lives of the civilian population, systematically depriving them of their most basic rights. Its forces haven’t stopped shooting at Palestinian fishermen and farmers, interrogating, torturing and detaining Palestinian medical patients seeking medical treatment at hospitals outside the Gaza Strip, preventing students from accessing their schools and universities, and went as far as calculating the minimum calorie intake needed to keep Palestinians in Gaza on the edge of starvation, and restricted food supplies accordingly. Moreover, Israeli forces have routinely damaged Gaza’s infrastructure, including schools, hospitals and healthcare centers, sanitation facilities and others, during periods that lay outside the so-called “cycles of violence”. Gaza’s infrastructure has been left decrepit, and continues to be on the brink of collapse. There seems to be no prospect of rebuilding it in order to meet the demands of an increasingly overcrowded population (Gaza’s population density is 4661 per square kilometer, rendering it one of the highest in the world). Israel continues to impose blanket restrictions on the import of construction material including cement, gravel, wood, piping, paint, glass and steel. This ban, the UN says, is having a devastating impact on Palestinian livelihoods and is causing a ‘process of de-development’. If Israel had really “left” Gaza, as its proponents argue, why, for instance, does it still give itself the formal authority to approve or block construction projects inside the Strip? This is precisely what happens to schools, for example, where dozens of projects spearheaded by UNRWA remain frozen, pending Israeli approval. Such is the extent of Israel’s control over Gaza that even the basic education of an entire generation of Palestinian children depends on Israeli “goodwill”. Slaves revolted against their masters countless times to earn their freedom. Who would dare to argue today that slaves were not within their right to resist the inhumanity inflicted on them? History will be a harsh judge in this case, too. Neutrality therefore is illusory. Choosing a supposed neutral position is as much a choice as taking a position. This position though is abandoning the oppressed and taking the side of the oppressor. Most certainly, Palestinian rocket fire and Israel’s intense bombing will eventually come to an end. Yet Palestinians will continue to live under Israel’s daily violence as the corporate media will be able to portray periods of “calm”, i.e. when only the expendable lives of Palestinians are lost. The naked truth will never be acknowledged. It will be consistently denied, and the Palestinians will, yet again, be blamed for their own death— as has always been the case in the wake of every aggression of this sort, and multiple they are. And yet, the world is still expecting peace to descend, somehow. My gloomy conclusions notwithstanding, there remains cause for hope in the international arena. At the level of people (not yet governments) Israel is losing ground and the terms of the discourse are rapidly shifting, mostly thanks to the growth of the movement for Boycott, Divestment and Sanctions (BDS), which Israel has termed a ‘strategic threat’. On the ground where I am, alas, justice remains a distant, fleeting prospect. Warning: The video below features images that readers might find distressing. Excellent piece. Thank you, Mohammad. May God preserve and protect you. Keep on educating. This is the only hope. And God’s help is sought.